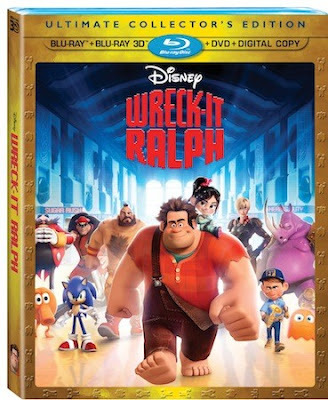 It looks like Disney will be making some coin from fans downloading a digital download of it's pixelated hit "Wreck-it-Ralph" be releasing it February 12th in HD and 3D on supported services a few weeks before the disc is released. The four disc Blu-ray 3D combo set is priced at $39.99 and will ship nearly a month later on March 5th, along with the 2-disc Blu-ray ($31.99), DVD and standard def video on-demand versions. Video Game Commercials – Viewers can check out the commercials created for the video games featured in the film - Fix It Felix Jr., Sugar Rush, Hero’s Duty and Fix It Felix Hammer. DisneyIntermission: The Gamer’s Guide to “Wreck-It-Ralph” – When the film is paused, host Chris Hardwick appears on screen to guide viewers through a series of 10 video segments offering an inside look at the many video game references, Disney references and other hidden surprises featured in the film. If you're like me you'll want to have the physical copy of this instant classic for your Disney library!